Tucket points to the old, four story building to the right of the lab. He seems to be referencing something invisible in front of him as he explains. “What have you got there?” I point to the ball in his hand. “It’s a Third Eye Hot Shot.” Tucket says, grinning. I wait for him to explain further, but he seems to think it unnecessary. The reference isn’t completely lost on me, however. I recall that Third Eye is the name of a tech company that produces perceptor chips in his century. The perceptors allow direct access to the user’s mind, allowing them to see a modified environment around them called the meta-space. The meta-space acts like an amped up version of the Internet, but layered over real world spaces. It allows users to see and interact with everything from media and advertising, to actual functional controls for objects in the real world. “You can use the meta-space all the way back in 2017?” I ask. Tucket shakes his head. “There’s no input this far back. Meta-mapping won’t get completed till the 2080s. But since I have a portable unit, I have access to all the data and programs I’ve downloaded whenever I go.” He holds the ball up. 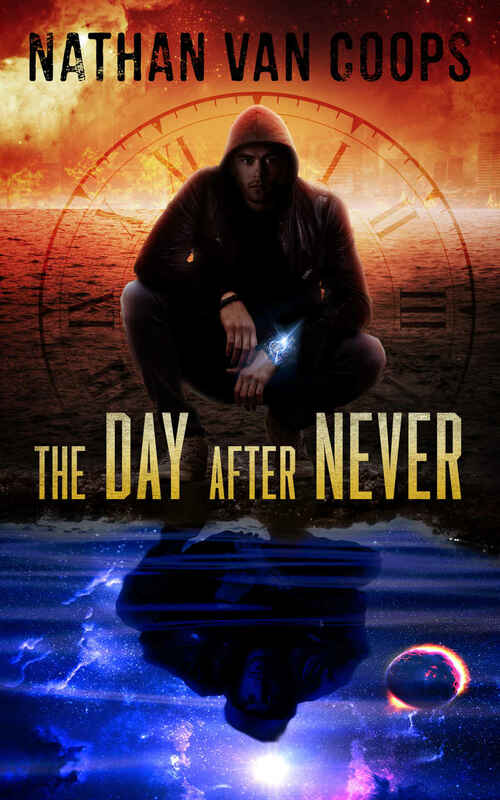 After In Times Like These and The Chronothon, The Day After Never is the third book in Van Coops’ time travel adventure series. He definitely left things open for another book. While I rated the first two with three stars, which is pretty high for my ratings key, I gave this one only two. It’s still a time travel adventure, but this time, the author put in mysticism to make the plot work. The first two books were as hard-core time travel as it gets. By that, I mean that the entire plot and the action are completely based on the unique premises that time travel concepts bring with them. This time he seems to have run out of unique time travel ideas. So he put in the Neverwhere, the place you go when you die, as a central concept. One of the Ben Travers that died in the second book is now one of the protagonists in the third book, living all in the Neverwhere. The book alternates between the two realities chapter for chapter, one in the Neverwhere, the other in the real world. In the Neverwhere, reality is conjured up by memories only. You can live in environments you can remember. You can also live in environments others can remember. And through memories you can create portals to the real world, invade those spaces and even people’s minds. Time travel concepts are extended to space travel, and at one point Ben and his buddies travel on a space ship trailing a comet for a time travel anchor. I am pretty sure that if you are reading this you are not whatsoever interested in this concept salad of a book. I wouldn’t be either. But having invested considerable time in Van Coops’ world of time travel by reading his first two books, I really didn’t have a choice, and I needed to finish it. I like the man’s writing, and creativity, and world-building skills. I also enjoyed his somewhat unorthodox and risky use of the present tense in his story telling. You can see the fast pace of action this method creates when you read the except I have supplied at the top of this post. Van Coops is, after Niffenegger, my favorite time travel author. While the book by itself would only get a star and a half, given that it’s part of a trilogy, I give it two – sort of for an uplift. Ha. Right after I finished this book, I thought, “There’s no way Norbert is giving this one three stars.” I started to tell you about it but decided not to prejudice you. Yep, you probably know me too well! I had a lot of problems with this instalment too – Ben’s different character, a few stagnant areas and a basic story line which I thought was quite unoriginal. But I think you make an excellent point about the amount of time already invested in reading the series which pushes us forwards. The time travel methodology is done really well – utilised best in The Chronothon, so there’s not much more to do with it except find more interesting anchors (like the comet!). I think the strength of the novel is in the futuristic world building – the synths and metaspace in particular. I struggled to sum up the whole novel with a star rating, but ultimately I thought that as a series piece where existing ideas are developed, and where the good bits outweigh the bad, I gave it full it marks. But yes, some bits drove me mad! Thanks, Paul, that was a very insightful comment. I wonder if he’s going to do another book down the line in the series. I am sure there can be new ideas.